The unofficial name for this bread is “Hurricane Irene Bread” because as soon as I knew I would be house-bound for the weekend, I decided I would need a loaf of something to sustain me. I turned to my trusty King Arthur Flour Baker’s Companion cookbook for a recipe, and settled on Crusty Italian Bread. To start, I began a biga on Friday night. After 16 hours it was bubbling and happy. Then the rest of the dough started to come together. After rising, shaping, and rising…it was time for baking. And once cooled, it was time for slicing, toasting, buttering, and eating. I repeated this process numerous times over the course of the weekend, since I was fortunate enough to not lose power, and it more than satisfied my fondness for snacking while reading, playing online Scrabble, and catching up on BBC mystery series. For my fellow East coasters, how did you spend Hurricane Irene? I especially want to know what you ate…you know, the important stuff. Mix together all ingredients until combined, then cover with plastic wrap and let it rest for 12-16 hours at room temperature. The bubbles will tell you it’s ready. Add the water to the biga and mix together. 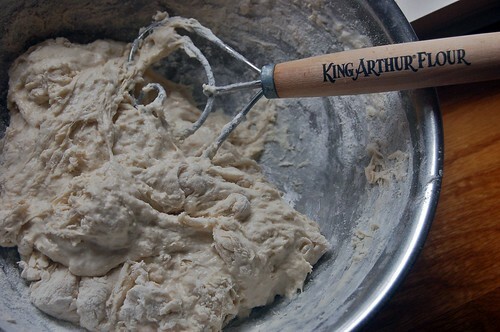 Add the flour, yeast, and salt and knead until smooth – 3 minutes by mixer or 5 minutes by hand. The gluten will have time to develop more during the rise so don’t go crazy with the kneading. 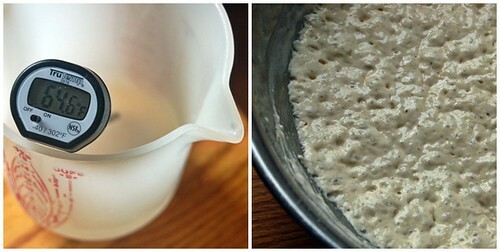 Place the dough in a lightly greased bowl and cover. Let it rise at room temperature for another 90 minutes. To help the gluten, gently deflate the dough from time to time and give it a flip in the bowl. Divide the dough into three pieces, and then braid them together. Set the braid on a lightly greased baking sheet, then cover with a clean kitchen towel and allow it to rise for another 60 – 90 minutes or until slightly puffy. When the second rise is almost finished, preheat the oven to 425 degrees. 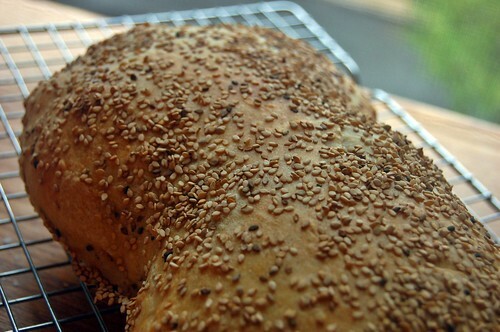 Using a pastry brush, coat the braid with the beaten egg and sprinkle on the sesame seeds. Bake for 25 – 35 minutes or until it has a hollow sound when rapped, and the internal temperature reaches 190 degrees. Cool on a wire rack, then enjoy! Note: I did a poor job with this loaf, so yours will most likely look a heck of a lot better than mine. I think I over-kneaded it the first time around, didn’t add enough flour because I underestimated the humidity in the air, then didn’t let it rise long enough during the second rise. 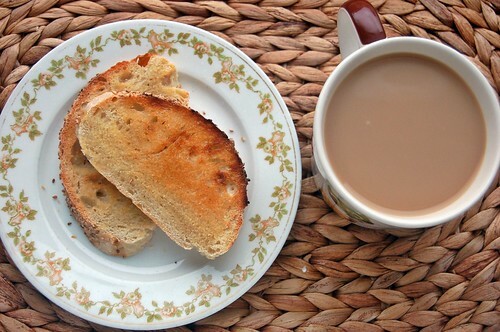 Having said all that, you can see that I STILL ended up with a tasty loaf that more than satisfied my toast cravings while Irene made me stir-crazy. And it just means I get to try it all again! We weren’t hit by Irene, but I followed it on the news. I would LOVE a loaf of this for dinner tonight (making pasta!). Hi Chris – I find them everywhere and I love them! They are indestructible! You should have no problem tracking some down in good condition on Ebay or Etsy. Good luck! Your bread looks great, and I’m glad you weren’t affected by Irene. 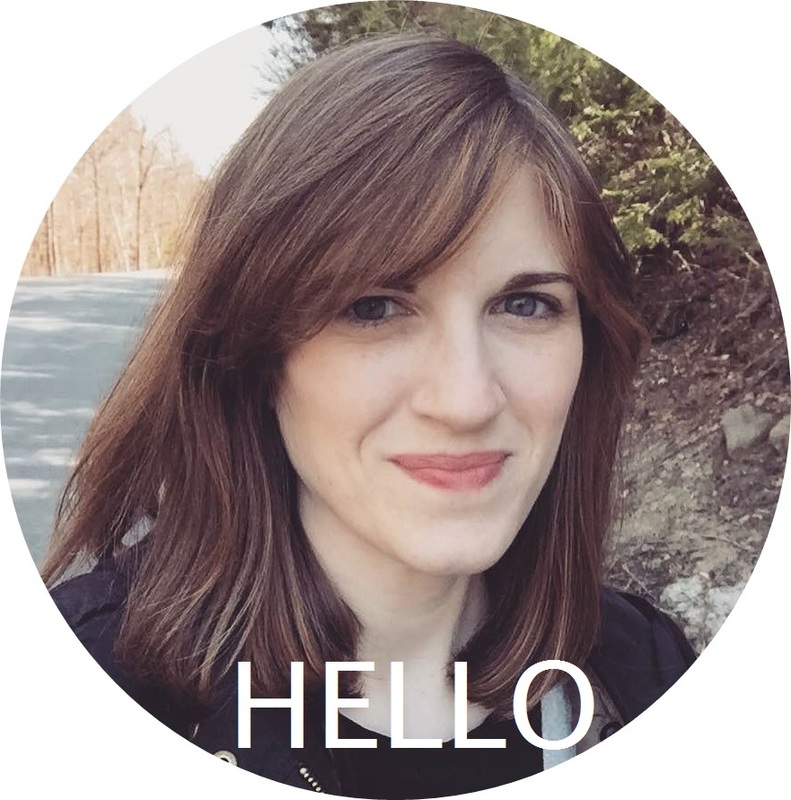 I also love that picture of you in your sidebar, that dress is really cute! thank you ursula! i love the dress in that picture. i got it at a thrift store and the skirt has so many slight pleats. I made some plum upside down cake and some raspberry lemon stuffed french toast. All delicious! We had sangria and some slow cooked beef.